James Churchward – wrote in his books on Mu that the Motherland stretched from the Hawaiian Islands to Fiji and from Easter Island to the Marianas. It was a tropical paradise much like Eden and was approximately 5,000 miles long and 3,000 miles wide . Churchward considered the Nan Modal site on Pohnpei Island one of the seven sacred cities of Mu. Today its ruins sit on a swampy lagoon filled with mangrove trees. We also see stone monument of mysterious orgin in dotting the entire pacific of which Easter Island is one. The Hawaaian and Pacific Islands are the remaining mountain peaks of this lost continent. When Mu was destroyed nearly 64 million people lost their lives . the final demise of Lemuria occurred perhaps only 10,700 years before the final destruction of Atlantis and the final destruction of Atlantis may have taken place over 10,000 years ago. The legends of Easter Island speak of Hiva, which sank beneath the waves as people fled, while Samoans called a similar place Bolutu. It was stocked with trees and plants bearing fruits and flowers, which were immediately replaced when picked. On Bolutu men could walk through trees, houses, and other physical objects without any resistance. The Maoris of New Zealand still talk about arriving long ago from a sinking island called Hawaiki, a vast and mountainous place on the other side of the water. H P Blatvatsky – In her book ,The Secret Doctrine , Madame Blatvatsky claimed to have learned of Lemuria in The Book of Dzyan – which she said was composed in Atlantis and shown to her by the Mahatmas. Blasvatsky located Lemuria in the Indian Ocean about 150 million years ago between Madagascar and Malaysia. She may have obtained her ideas of a sunken land in the Indian Ocean from Sanskrit legends of the former continent of Rutas that sank beneath the sea. The Rig Veda in particular speaks of “the three continents that were”; the third was home to a race called the Danavas. A land called Rutas was an immense continent far to the east of India and home to a race of sun-worshippers. But Rutas was torn asunder by a volcanic upheaval and sent to the ocean depths. Fragments remained as Indonesia and the Pacific islands, and a few survivors reached India, where they became the elite Brahman caste. A List of 115 Dead Scientists… Assassinated? Can anyone guess WHY? Anyone? This particular Swiss note is from the ’6th Series’ of Swiss bank notes, issued in November 1979 and withdrawn in May 2000. Look at the circles. 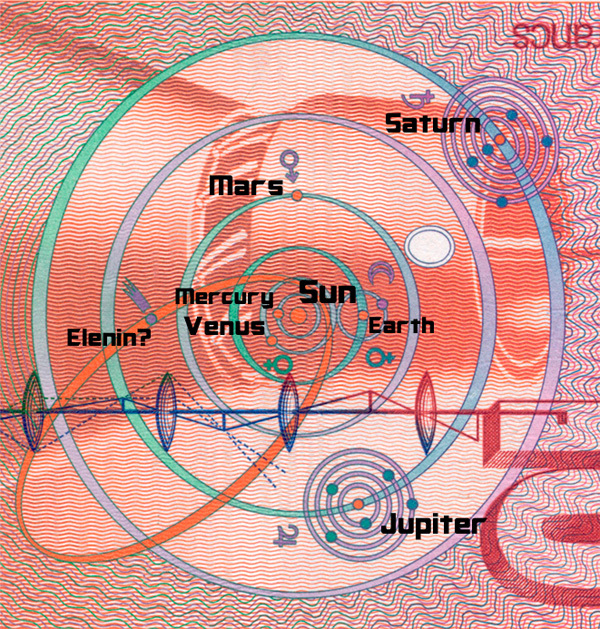 The blue-green circles represent the orbits of the planets in our solar system. The red dot in each circle represents the location of a planet. The big red dot in the center represents our Sun. The first circle represents Mercury’s orbit and the red dot on this circle represents Mercury. The second is Venus. The third is Earth. Notice the blue dot circling the Earth, this is the Moon(which is emphasised by the symbol of a moon drawn near it). The next circle is representing Mars and its orbit. The next circle represents a planet with five moons, which is Jupiter(Jupiter has 64 moons). The final circle is Saturn with its moons(Saturn has 62 Moons). The red elliptical orbit represents the path of a long period object like a comet, which I think is Elenin. Note the blue object within this elliptical orbit and its tail. God created man in his image; in the divine image he created him. Male and female he created him. And he named the man “Adam” because he had come from the clay. Then God placed the man in the garden, in Eden in the East. And he formed out of the ground various wild animals and various birds of the air and every creeping thing. And these he brought before the man to name them. And whatever the man called each of them, that would be its name. And God gave man dominion over each named thing. But the man was lonely, for among all the created beasts, none was a fit partner for him. And so God divided Adam, male and female he divided him, into two whole beings he divided him. And the first, which was Adam, became male. And the second, which was female, was Lilith. And Lilith was the likeness and equal of man. And God told Adam and Lilith to go forth together in the garden. Lilith walked alongside Adam and saw the various wild beasts and the birds of the air and she called them by name. But the names which she spoke were not Adam’s names. He grew wroth with her, as her names threatened his dominion over things. And so Lilith sought out things which the man had not named. To the secret, hidden things overlooked by Adam did she give names. The darkness after the sun frightened the man, and so he had shunned it, putting no name to what he feared. Lilith gave it a name, and she was frightened no longer. And she named the Night and the Moon and all the Stars of the Heavens, in addition to all the secret things. And over these things, did Lilith hold dominion. Then Adam sought to lie down with Lilith. He stretched her out on the ground beneath him, but Lilith sat up atop his thighs. At this Adam grew wroth and sought to lay her again upon the ground beneath him. Lilith wrestled with Adam and sought to lie with him side by side, as equals. Then Adam grew very wroth and Lilith withdrew to the other side of the garden. When God came seeking them both in the garden, he found only Adam. And God asked the man, “Where is Lilith whom I made for you out of your own being?” And Adam told God that Lilith had fought with him and refused to lie beneath him as he felt she should. “For do not all the wild beasts in the garden lie with their partners beneath them, the male atop the female?” So God went seeking Lilith. And he found her on the other side of the garden, beneath the Tree of Life. And so Lilith left the garden. And she wandered alone in the wilderness, east of the garden of Eden. And before long she found she was with child, from when she had lain with Adam. 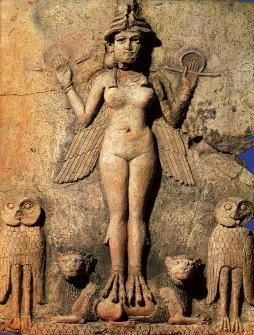 And when it was her time, she brought forth a son and a daughter, male and female in the image of Lilith and Adam. And God’s curse had fallen to both of them. Then Lilith settled with her children in the land of Nod, east of Eden, and there she taught them all the secret things which she had lain claim to in the garden. And she taught them the names of the Night and the Moon and the Stars in the Heavens so they too could hold dominion over these things and no longer be afraid. And they dwelt in darkness, for the day was the dominion of the man. And then it came about that Adam and his wife Eve were cast from the garden. And they wandered in the wilderness, wailing that their God had punished them. And Eve bore two sons, the first Cain and the second Abel. And Cain was a tiller of the fields and Abel was a keeper of beasts. And God demanded sacrifices from both sons, so that they may offer up the fruit of their labors to him. And Cain brought forth the fruits of his harvest, and Abel slew a firstling from his flock. And God was much pleased with the blood of the firstling, and he looked with favor upon Abel for this. And Cain, seeing that God so savored the blood, drew his brother into a field and slew him and offered the blood up in sacrifice. And God grew wroth at Cain for murdering his brother and he made him to wander the earth all the days of his life. And neither would the fields yield up their harvest to him any longer. And he put a mark upon Cain’s forehead, so that all would know him on sight. And Cain fled to Nod and encountered Lilith and her children living there. And Lilith looked kindly upon Cain, who had been made a wanderer like herself. And she took him in and taught him the secrets she had gained in the garden. And Cain learned the ways of Lilith and her children so that Lilith loved him as one of her own. And Cain took as his wife one of Lilith’s daughters, and she conceived and bore for him a son. And Cain named his son Enoch. And thus through Cain was Lilith’s line once more united with the children of man. And in time they lived uneasily among them, keeping separate in their hearts for thus was the curse that God had placed upon them. Lilith did go back to Adam briefly,bore three sons: Shedim, Lilin, and Rauchin. Lilith is referred to over and over again in introductions and personal stories of women everywhere – artists, writers, scholars – as the one who appeared to them at the moment of their spiritual awakening and birth to their creativity. They describe themselves as being led – guided by her on their journey. All seem to agree that Lilith is a force for women now. She comes at the perilous moment of our death and rebirth, the time when the life-force hangs in the balance. She is here to resuscitate us. She has come to rescue our souls. A person without power is stillborn. True power is inner power, the Goddess within, the life-force. Modern women, afraid of our power, afraid of the consequences the invocation of our power may provoke, decline Lilith’s invitation, ignore the desire we feel deep within us, remain still born, in our still lives. Lilith’s punishment for disobeying the father God is that she loses one hundred of her children each day. These children are us: women. We are all her daughters. Let us finally end Lilith’s punishment. Let us find a way to live.